You're walking down the aisle, you've made your grand entrance, you've said your “I do's” and now its time to head back down the aisle as a newly married couple! Just like all eyes were on you when you entered, they will be just as fixed on you when you leave. Their eyes may be teary now but trust me, they are scoping out how the back of your gorgeous dress looks as you bust through the venue doors. With this in mind, here are the things you should consider about the back of your wedding dress when choosing your dream gown. Let's break this down into two parts: the top of the gown and the bottom. Starting with the top, there are a million different ways the back of your gown can look. Some of my personal favorites are illusion or buttons down the back. Corsets are next in line as one of my classic faves. While these three styles seem totally different to me, they all exude elegance. Another popular style is to have an open back gown; not to be confused with a low back gown. Just because your back is open doesn't mean it has to be low as well. If low back gowns are your thing though, then I say work it honey! Keyhole back gowns are a happy medium where there is an open shape in the back of the gown. Of course you are always free to opt for a gown with a regular back, perhaps to help balance out that plunging V-neckline that you were dying to have. One thing to remember though is that whatever you choose, make sure that the back of your gown balances out with the front. They should both evoke similar or complimentary styles without going too overboard. Now for the bottom of the gown. The big question here is are you going for a dramatic flourish or keeping it simple. If you are all about the drama, then a wonderfully layered skirt would be great or perhaps a ruffled extravaganza! 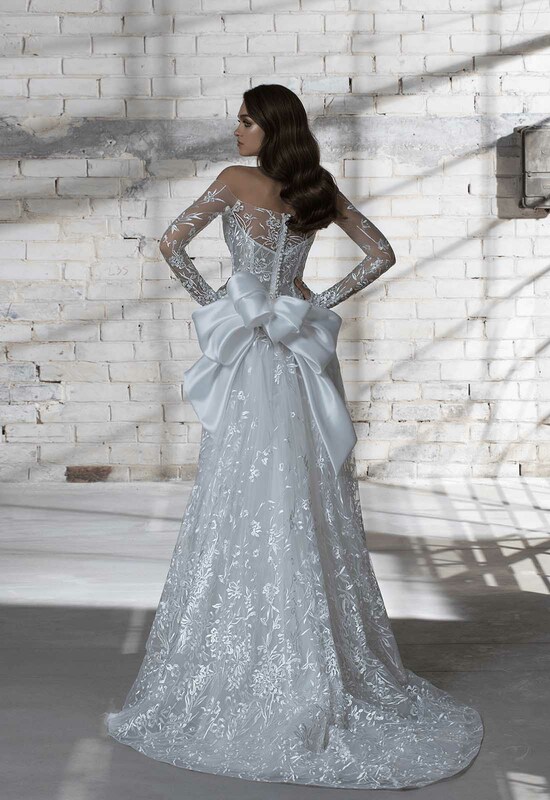 Maybe you would just love an enchanting train that trails beautifully from your gown. It could be tapered or rounded off. It could be simple and sensible or your train could be as long as the checkout line at Sephora. Whatever your heart desires, when working with the right designer, changes can be made to work for your style. You may only be leaving to head off to your fun-filled reception but you will still want to give your guests something to remember as they watch you go. Looking back at your wedding photos years from now, you will thank me. It will be all worth it when you see your love checking you out when you weren't looking or see that cute silhouette photo your amazing photographer took. From front to back, you will be looking picture perfect!